Starting this spring, a new program will give employees of the West Kootenay city a chance to buy an electric bike, or e-bike, through the city and then gradually pay back the cost of the bike with a regular deduction from their paychecks. Nelson may be built on the side of a mountain, but that won't stop an e-bike — which is one reason why the city is encouraging its staff to commute using the motor-assisted bicycles. Starting this spring, a new program will give employees of the West Kootenay city a chance to buy an electric bike through the city and then gradually pay back the cost with regular deductions from their paychecks. "Nelson is very hilly so e-bikes are an excellent option for this part of the world," said city Coun. Jesse Woodward. E-bikes are pedalled like a regular bike, but they have an electric motor that can help out when necessary. They range in price, but many cost between $2,000 and $5,000. 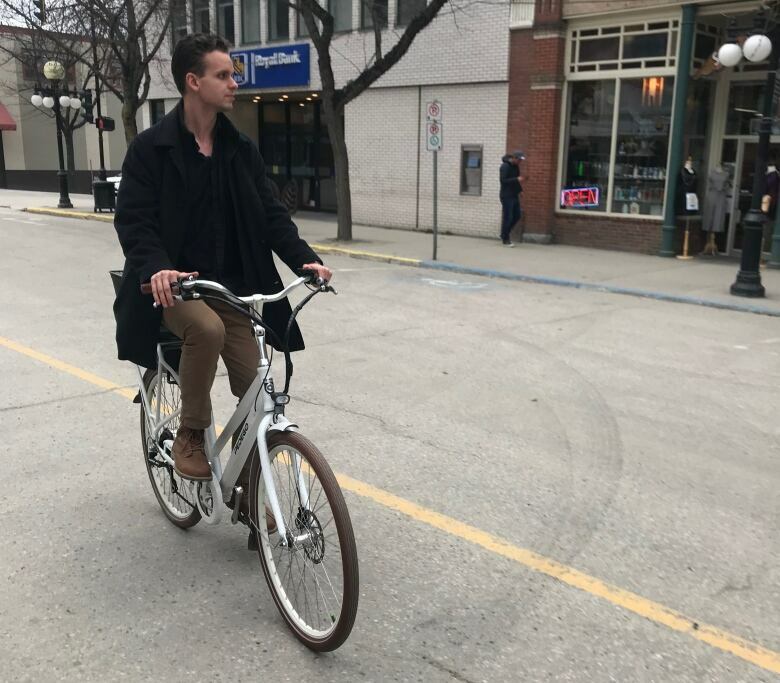 City planner Alex Thumm said he's been enjoying riding his e-bike to work for the past couple weeks, even when it's been cold outside. "A lot of times it's faster than driving between home and work," Thumm told CBC's Bob Keating. "I love it. I feel way better. The fresh air in the morning, it wakes you up." Traffic and finding parking spots can be a challenge in downtown Nelson, so the city hopes e-bikes will help commuters get to work. They also provide some exercise. "It's a myth that you don't get any exercise when you're on an electric bike. You actually do pedal," Thumm said. The 26-year-old hopes that riding his e-bike will help save money. Thumm recently sold his 2007 Subaru Forester and said he used to pay $174 a month for insurance, even with a clean driving record. Ross McNamara, owner of Gerick Cycle and Ski in Nelson, carries lots of different e-bikes and has more models coming. "I think [the program is] amazing. I think it will be a game-changer and precedent setting for other cities all over the place," said McNamara. "One of the biggest complaints in this town, aside from the fact that it's difficult to get back up the hills on a conventional or a classic bike, is that there just isn't enough space for the number of vehicles," he said. "The town is going to get busier and busier, so these are just really positive." If the program with city staff is successful, Woodward said council hopes to expand it. From police cats to a UBC Hawaiian campus, you've been punk'd, B.C.